Daryl’s heart thrilled to the sound of those two simple words. His eyes twinkled, and a grin lit up his face. Daryl loved to play ball, any kind of ball. For him, summer was soccer and the smacking sound his foot made when he kicked the black and white ball with all his might. Fall was football and the crunch of shoulder pads. Winter was basketball and the swoosh of baskets swishing the rim. Daryl frowned at the thought. 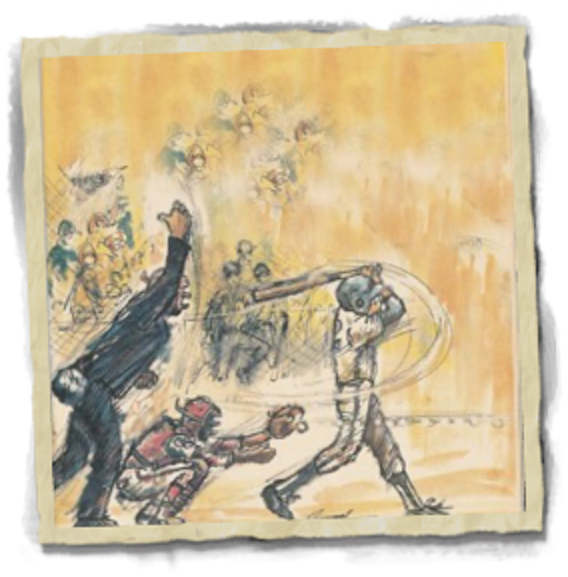 Spring should be the crack of his bat against the baseball, sending it soaring, but spring was more like the swoosh of basketball because Daryl always struck out. “East out, easy out,” the other team chanted when Daryl came to bat. Daryl knew they were right. He was an easy out. “St--RIIIIKE three,” the umpire hollered. “ Oooh, no,” groaned his team. There was just something about the little white ball growing bigger and bigger as it sped toward him, freezing his muscles, making him shake and swing wildly. If only he could close his eyes when he swung. Then it might be all right. But Daryl knew he shouldn’t do that. A good player had to keep his eyes on the ball -- always. Grabbing his glove, Daryl raced to left field. At least I can catch and throw, Daryl told himself. A grounder didn’t scare him. Catching a grounder was like trapping a little white mouse that scurried toward him, bumping and skipping over the field. The roar of the crowd pulled Daryl’s attention back to the game. The second batter was already racing toward first base. For a brief moment the sun was behind a cloud, and Daryl knew the ball was coming his way. Knocking his cap from his head, Daryl searched the afternoon sky. Where? Where was it? Then he saw it looming over his head. Daryl took two steps backward. He was ready. A fly ball didn’t scare him. Catching a fly ball was like catching the moon as it hovered over him. Daryl waited until just the right moment, holding his glove steady. He had it. A well-placed throw sent it beaming toward second base. The second baseman made the tag. A double play! Daryl jumped for joy. At least he wouldn’t be warming the bench, not with a play like that. If only...if only he could bat. Daryl’s turn at bat came around faster than he wanted it to. He took a deep breath. He hated to bat. He hated the swinging, the missing, and the disappointment of striking out again. But most of all, he hated letting his team down. Daryl cocked his head, thinking. He knew “It’s a piece of cake” meant something was supposed to be easy, but batting wasn’t easy. At least it wasn’t easy for him. As the pitcher wound up, Daryl firmly gripped the bat. “It’s a piece of cake. It’s a piece of cake. It’s a piece of cake,” he chanted over the jeers of the infield. And suddenly it was, because racing toward him was not the familiar hard ball, but a big, white fluffy cake. Daryl knew he could hit it. Anybody could hit a cake. It was too big to miss. Crack! The bat slammed into the ball, sending it scampering toward third base like a frantic white mouse. Daryl was stunned. A cake goes splat, not crack. He had hit the ball. He had head the sound he’d been waiting to hear all season. “Run! run!” urged his coach. Daryl dropped the bat and ran, pounding his feet down the base line. When he reached first base, all his teammates were on their feet, cheering. Daryl couldn’t believe his ears. They were cheering for him. “Nice hit,” yelled the first base coach. “Piece of cake!” whooped Daryl, grinning from ear to ear.